(Augusta, GA) Tiger Woods still has Masters winning history on his side after an adventurous 73 on his first return to Augusta National since 2015. Woods’ much-anticipated return to the hallowed grounds in Georgia easily drew the biggest patron’s attendance around the opening tee mid-morning. It has been three years since we’ve heard the Masters starter say: “Fore please, Tiger Woods now driving”. But as Woods has done so often in his Majors career, he failed to find the opening hole fairway pulling his drive into trees up the left side but scrambling to make par. Woods set off the first of three ‘Tiger Roar’s’ in pitching to 10-feet at the par-4 third hole for his first Augusta birdie since April 12, 2015 when he birdied the 15th on the final day. He then dropped shots at four and five to be at one-over par before making the turn with four straight pars. Woods parred the downhill 10th but then sent patrons scattering following a wild drive right off the tee at the par-4 11th, which is the opening hole at ‘Amen Corner’. Staff managed to clear a path for Woods take a bogey ‘5’ to drop to two-over. 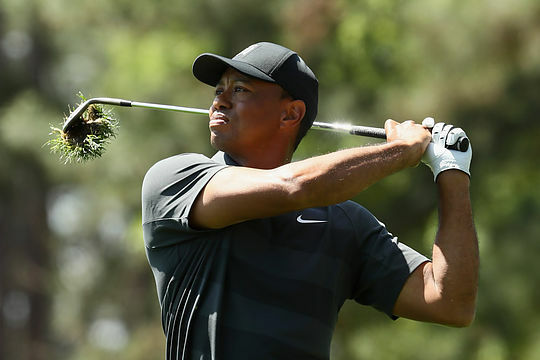 Woods found the water guarding the green at the par-2 12th and while he holed the 18-footer for bogey, and the best putt of his round, he’d dropped to three-over and with many suggesting talk of being the Masters favourite was very over-rated. But Woods was having none of it after landing his second into the par-4 14th to 10-feet to record his 11th birdie on the hole and, at the time, just the second birdie all morning at the 14th and playing as the hardest on the course. Wood then got back to one-over in finding the green at the par-3 16th, and where we all remember ‘that’ chip-shot to win the 2005 Masters, and rolled in a curling 25-footer for his 10th birdie at the hole. He walked-up the last to a standing ovation completing his return to Augusta with a 73. “I definitely didn’t score as well as I played,” Woods said. Woods’ biggest failure was failing to birdie any of the four par-5s at Augusta National. Traditionally, Woods eats the Augusta par-5s for breakfast, lunch and dinner, and Thursday was only the fifth time in 79 career rounds at the Masters that Woods failed to birdie any of the par-5s. In his Tuesday practice round alongside Phil Mickelson, Woods eagled Nos. 13 and 15. “I played the par-5s very sloppily today,” said Woods. But, the last time Woods won the Masters (2005) he signed for an opening 74.